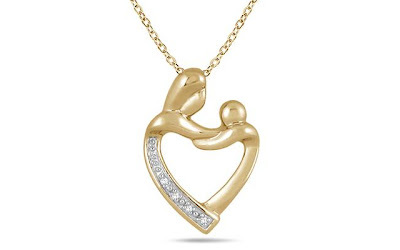 This Mother and Baby Diamond Pendant 18" Necklace in Gold Plated Sterling Silver is selling today for just $19.00 at Szul.com! You will be saving 90% off the listed price of $189.00 with this jewelry deal. This promotional price is good through 3/31, so do not wait to take advantage of this great Mother's Day gift deal. This price is valid for today only, so do not wait too long to take advantage of this discounted price.